Did Monday’s Storm Set a Reporting Record? A storm system that stretched from the Mississippi River to the mid-Atlantic states on Monday brought more than 1,300 reports of severe weather in a 24-hour period, including 43 tornado events. The extraordinary number of reports testifies to the intensity of the storm, which has been blamed for at least nine deaths, but it also reflects changes in the way severe weather is reported to–and recorded by–the Storm Prediction Center. As pointed out by Accuweather’s Brian Edwards, the SPC recently removed filters that previously prevented multiple reports of the same event that occurred within 15 miles of each other. Essentially, all reports are now accepted, regardless of their proximity to other reports. Additionally, with ever-improving technology, there are almost certainly more people sending reports from more locations than ever before (and this is especially true in highly populated areas such as much of the area covered by this storm). So while the intensity of the storm may not set any records, the reporting of it is one for the books. 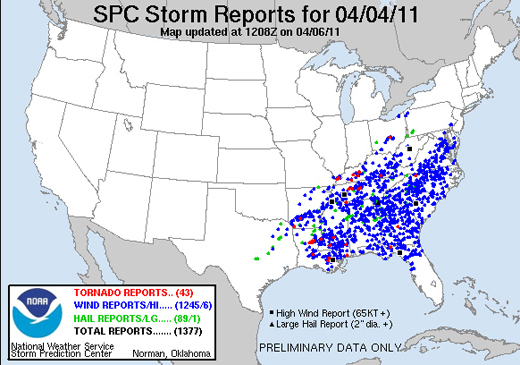 According to the SPC’s Greg Carbin, Monday’s event was one of the three most reported storms on record, rivaled only by events on May 30, 2004 and April 2, 2006.